Leafy Harrow offers more affordable suburban living with great links to the city. Rentify can help you make the most of your letting with our handy borough guide. At Rentify we have property specialists dedicated to Harrow, armed with local expertise and unmatched valuation knowledge to find you the right tenants. The London Borough of Harrow is a fantastic choice for tenants looking for a quiet suburban home. Much of the borough enjoys a good standard of living, and there tends to be less disparity in wealth. While there’s less going on in Harrow compared with other London boroughs, it’s generally a safe and green environment that is perfect for bringing up children. Many families enjoy the village feel offered by districts such as Stanmore, and the borough also benefits from good schools, including the well-renowned Harrow School. What’s more, Harrow caters to commuters with great transport options. Several tube lines and London Overground connect residents to central London, and mainline rail services provide quick journeys to Marylebone and Euston. Harrow offers much more in the way of semi detached, detached and terraced housing compared with other London boroughs, which are great for families. Yet there are still plenty of flats available for single professionals and couples seeking a quieter life. Harrow's many districts each have their own character, catering to a variety of residents. Here's our top picks for new landlords in the area. 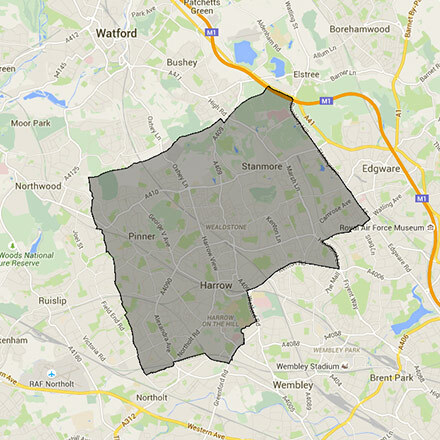 This borough covers the HA0, HA1, HA2, HA3, HA5, HA7, HA8, NW9 and UB5 postcodes. Rentify uses proprietary methodology for data collection and processing. Borough data is collected from Rentify's property database and external public sources.